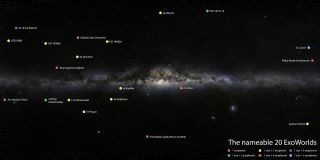 This graphic shows the 20 extrasolar systems open for naming in the "NameExoWorlds" contest, organized by the International Astronomical Union and Zooniverse. Space fans around the globe will soon get a chance to help name some of the galaxy's most famous alien worlds. The NameExoWorlds contest has kicked off, allowing astronomy clubs and nonprofits to propose names for the stars and planets in 20 different extrasolar systems, officials of the International Astronomical Union (IAU), which is organizing the competition along with the citizen-science project Zooniverse, announced Monday (April 27). Submissions are due by June 15, after which the public will be asked to vote on the proposed names. The current plan calls for the final results to be announced during the IAU's 29th General Assembly in Honolulu, which runs from Aug. 3 through Aug. 14 of this year, IAU officials said. The 20 extrasolar systems include 51 Pegasi, which harbors the first alien world ever discovered orbiting a sunlike star (in 1995), and Fomalhaut, which was one of the first exoplanets ever to be imaged directly (though there is currently some controversy about whether or not the "planet" is really just the rocky remnants of a massive collision). The 20 systems contain 32 known planets. Five of the host stars already have popular, common names, so they're off-limits to the NameExoWorlds contest, which therefore offers the opportunity to give appellations to a total of 47 objects (planets plus stars). The IAU assigns "official" names to celestial bodies and their features. The organization is perhaps best known to laypeople for demoting Pluto from a "true" planet to the newly created category of "dwarf planet" in 2006, a decision that remains controversial to this day. The first exoplanets were discovered orbiting a pulsar — a rapidly spinning, superdense stellar corpse — in 1992. Since then, scientists have spotted nearly 2,000 more, with thousands of additional planet candidates awaiting confirmation by follow-up observations and analysis. But those numbers are just the tip of the iceberg. Work by NASA's Kepler space telescope suggests that every star in the Milky Way hosts at least one planet on average, meaning our galaxy is probably home to more than 100 billion alien worlds.